The extremely well designed SOLE E35 from SOLE Fitness is built to make your elliptical workout as easy and comfortable as possible. Features like high adjustability and easy controls make operating the machine effortless, allowing you to focus your effort on breaking a sweat and toning up. The SOLE E35 features handheld heart rate monitoring and also comes with a chest strap for hands-free convenience. Incline and resistance levels can be set with the push of a button located on the handlebars, and the stride length and incline degree options are far beyond what you’ll see in most competing elliptical machines. The stride on the elliptical machine can be adjusted from 20’ to 22” and has fully adjustable footrests, while the incline can be set up to a challenging 30°. And that’s just the beginning. This is a club-grade machine with the features to match. Read on and we’ll break down the SOLE E35 in our full elliptical review below. Click here to check the price of the SOLE E35 Elliptical Trainer on Amazon. Stride length of 20-22” to accommodate all shapes and sizes. 16 resistance levels through the Eddy Current Brake (ECB) system that adjust at the push of a button from the handlebars. Up to 30° of incline, all adjustable by automatic controls from the handlebars. Heart rate monitoring on handlebar grips and with an included chest strap for hands free application. Engineer and physical therapist-designed, fully adjustable foot pedals offer a 2° inward slope to reduce knee and ankle strain and match natural form. Built-in cooling fan to keep the user cool throughout their workout. 7.5” backlit and tiltable LCD display. 10 programs including 6 pre-programmed workouts, 2 user defined programs and 2 heart rate programs. Built-in speakers and a plug-in for an iPod® or MP3 player. The SOLE Elliptical E35 comes securely boxed and packaged. As the machine weighs 215 lbs, the shipping box is obviously going to weigh at least that amount. So, if possible, you’ll want the delivery people to take it directly to the room you plan on installing the elliptical or you’ll likely have to get some help later to move it. It will take a few hours to assemble the E35, so take your time. It’s not hard to assemble (many users find it to be quite easy), but this a sturdy, high-tech piece of machinery and it has a lot of components. It does come with all the tool necessary for assembly, but you may want to use your own as well. SOLE Fitness has been providing quality exercise equipment throughout North America for decades. They have been the fastest growing brand in the US and Canada the last five years. Their target market are hotels nationwide, but have slowly evolved into residential sales. SOLE Fitness equipment is known for strong performance under rigorous use. They provide lines of bikes (both upright and recumbent), treadmills, elliptical machines, and rowers. The SOLE E35 Elliptical is a crowd pleaser. A leading consumer website even named it their 2014 Best Buy winner. Overall, Sole Fitness is known for providing high quality, commercial grade exercise equipment to the hotel industry, and now they’re bringing that same equipment to your home. The solidly constructed E35 SOLE Elliptical packs in a number of conveniences that provide the user with a comfortable, club-quality workout. The SOLE E35 Elliptical is a durable machine. Sole Fitness’s main business is in the hotel industry where exercise equipment is used non-stop and not really cared for. It has to be durably built and well constructed. So they’ve extended this same level of quality to their home exercise equipment. You can go as hard as you want on E35 SOLE Elliptical; it isn’t going to move. The maximum user weight is 375 lbs, which says a lot. Sole Fitness speaks even louder by providing solid warranties. The SOLE Elliptical E35 features powered incline, which is a great option considering that you don’t have to stop your exercises if you want to increase your resistance or work different muscle groups. The controls for the incline are conveniently positioned on the handlebars so you never have to take your hands off. And most impressive is that the incline can rise up to 30°. Most elliptical machines only have 20° inclines. The stride on the E35 SOLE Elliptical can be adjusted from 20-22” so anyone can exercise comfortably and get the benefits of a full elliptical motion. The footrests themselves are completely adjustable and have a slight inward slope of 2° to take stress off of the knees and ankles. This is extremely useful for users who are using the elliptical machine for rehabilitation purposes. This elliptical machine also allows the user to pedal backwards so even more muscle groups can be worked out. The E35 SOLE Elliptical provides automated Eddy Current Brake (ECB) resistance from controls mounted on the handlebars and includes 16 settings. 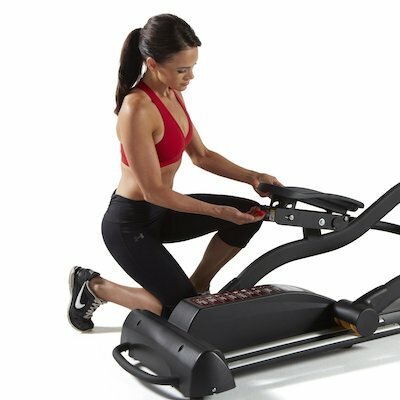 The SOLE Fitness E35 Elliptical comes with 10 workouts programs. Some other elliptical trainers come with more, but if you’re like most people, then 10 varied workouts is plenty. Assembly is easy and even Sole Fitness doesn’t recommend you pay for it with delivery. That said it does take some time to assemble as we mentioned. But once you’ve got it put together, that’s it! You’re off and working out. 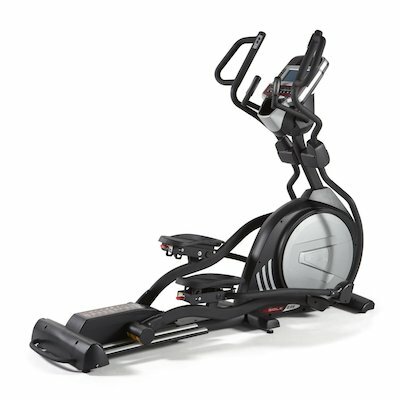 The SOLE E35 Elliptical is truly a great buy for the price. You’re going to love having one in your home. It’s full of top-notch features and feels like the best ellipticals you may have used at a club or hotel gym. It’s smooth, quiet, stable, and great on your joints. Highly recommended.